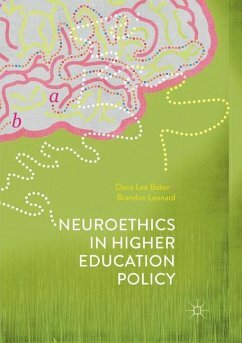 This book focuses on neuroethics in higher education in the United States. After introducing readers to the philosophical and policy foundations of the neuroethics of higher education, this book explores essential conundrums in the neuroethical practice of higher education in modern democracies. Focusing on neuroethics from the perspective of universally designed learning and policy design sets this project apart from other work in the field. Advances in neuroscience and changes in attitudes towards disability have identified mechanisms by which higher education infrastructures interact with both individuals considered neurotypical and those with identified disabilities to diminish students' capacity to enter, persist, and complete higher education. Policy to date has focused on identified disabilities as a requirement for accommodations. This strategy both underestimates the effect of ill-fitting infrastructures on those considered neurologically typical and serves to stratify the student body. As a result, neuroethical gaps abound in higher education. Dana Lee Baker, PhD, is Associate Professor in the School of Politics, Philosophy, and Public Affairs at Washington State University, USA. Dr. Baker is the author of The Politics of Neurodiversity (2011) and the editor of Disability and U.S. Politics (2016). Brandon Leonard, MSW, is a US Army Veteran and current social work practitioner. In his practice, Brandon operates from a Trauma Informed perspective oriented by Queer Theory, Social Learning Theory, and Systems Theory. Brandon has worked in the Department of Veterans Affairs and the non-profit sector.